According to Police in the Cheshire area, children are being targeted by a new WhatsApp scam in which they receive a text claiming to be from a friend of a friend who has a new phone number. 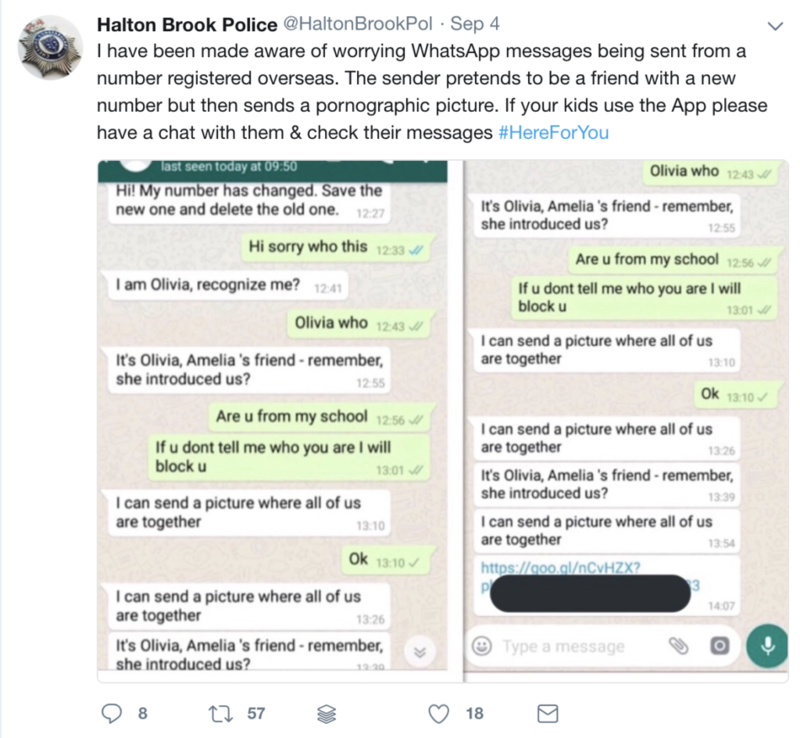 According to Halton Brook Police the messages are being sent from a registered number overseas calling themselves Oliva. If a recipient receives a text and replies back asking for more information, then the sender offers to send a picture to ‘prove’ their identity but the link they receive back is a pornographic image. The scam which has been dubbed the ‘Oliva Hoax’ is specifically targeting children so police have advised parents to be vigilant. What is WhatsApp doing about these scams? That’s a great question. Social Media platforms and Messaging Apps are regularly targeted by scammers. WhatsApp has released some advice for users who are concerned about scams and hoax messages. • The sender claims to be affiliated with WhatsApp. • The message content includes instructions to forward the message. • The message claims you can avoid punishment, like account suspension, if you forward the message. So what can you do if you receive the ‘Oliva’ Hoax or other Scam messages? When it comes to promises of ‘gifts or rewards’ remember in the online world, if it’s too good to be true – it most likely is. WhatsApp advices users to block the sender, disregard the message and delete it. Remember online scams are on the rise so it’s important to protect yourself. Be vigilant when using social media websites and the internet. As we highlighted in our previous blog about another WhatsApp scam, be careful about clicking on unsolicited links even if they are from a trusted friend or someone within your contacts.